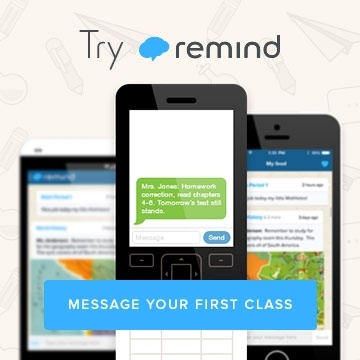 Remind.com is a great way to communicate with your students and/or their parents via text messaging or email updates. When a teacher registers for a for a free account they are asked to create a classroom. Once the classroom is created, a unique code is generated for that classroom that allows for those students and/or parents to register using SMS or an email address. After subscribing to receive the classroom reminders, subscribers are automatically added to the classroom roster. As names are added to the roster the teacher can begin to send out a single text message containing important reminders such as test dates, upcoming conferences, field trips, project due dates, etc., that will be sent to every student and parent listed on the roster. Additionally, each time a new class is created directions are automatically generated as a .pdf explaining the process students and parents will need to take in order to receive the reminder updates. Remind allows students to text their teachers with any clarifying questions, but teachers can adjust the settings so that students and parents are unable to reply or text back a response. This setting is important for those teachers who are simply looking for one way communication. Lastly, Students and parents also have the option to download the app to their smartphone in order receive notifications and have the option to search for other teachers in their building. As you can see from the screenshot below, the remind interface has come a long way over the last few years. The flat design makes for a very clean and professional looking interface. You can sign up for a remind account and begin setting up your classes immediately after signing in with your Henrico Google Apps for Education credentials. You can also use the remind widgets to embed your reminders in a classroom blog or Google Site. Remind does a good job with social media integration as well. Any reminders you post has the option to be sent out as a Tweet.